This month's The Weekend Gourmet Dines Out featured restaurant is the Houston location of Grand Lux Cafe. Located directly across the street from Houston's large Galleria shopping complex, this is one of a dozen Grand Lux Cafe locations. Grand Lux is owned by the same company that owns Cheesecake Factory. Their menu concepts are similar, but the two restaurants are separate entities. We were recently invited to come for a dinner tasting, and we were very impressed by the quality of the food offered. 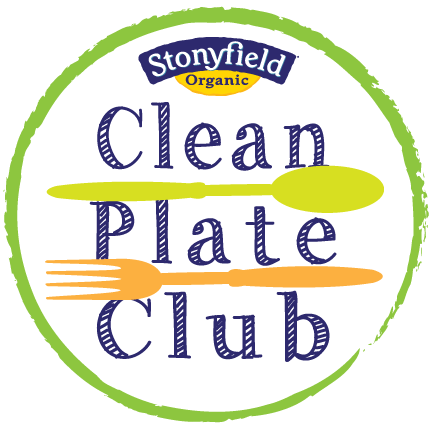 Our group was warmly greeted and showed to our table. Our group started out by selecting cocktails and a duo of appetizers. I opted for a bubbly champagne-based strawberry while the guys opted for the Bourbon Smash, Passion in Paradise (made with passion fruit, pineapple, and spiced rum), and Whiskey and Peach. All were expertly prepared, with a festive presentation. 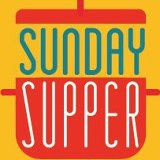 For our appetizers, we shared the creative Double Stuffed Potato Spring Rolls and the Crabcakes with Spicy Mustard Sauce. The spring rolls were perfectly crispy outside and filled with creamy mashed potatoes. They were garnished with bacon, cheese, and green onions and served with sour cream for dipping. They reminded me of an upscale potato skin appetizer...so fun! The crabcakes were crispy outside, and the inside was moist with lots of sweet crab meat. Next up were a trio of entrees. Michael is a seafood lover, so he opted for Grand Lux's amazing Shrimp Scampi. It featured large butterfly shrimp sauteed with white wine, lemon, garlic, tomato, basil, parsley, and a touch of cream. It was served over thin spaghetti. This dish was so flavorful! 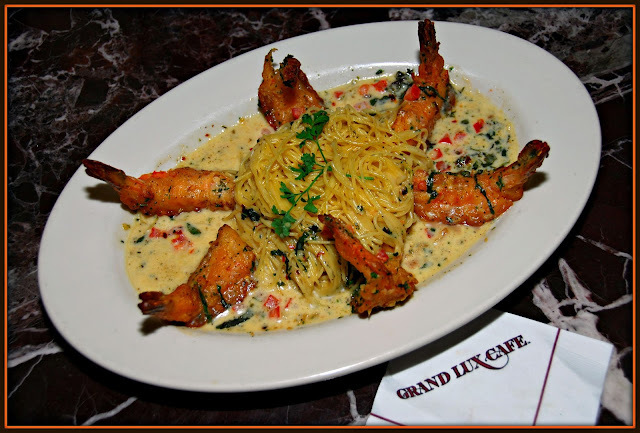 The shrimp and pasta were perfectly cooked, and the sauce featured robust lemon and garlic flavors. I opted for the big-enough-to-share Seafood Salad. This light, yet hearty, salad features lump crab meat, boiled shrimp, avocado, tomatoes, corn, green beans, boiled egg, celery, and green onion. 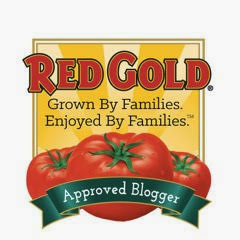 It's served Cobb style on a bed of crisp romaine lettuce that's tossed with a creamy and slightly spicy Louis dressing. This salad was a symphony of flavors -- pretty to look at and delicious to eat! The other two people at our table opted for a Grilled Ribeye with a loaded baked potato. 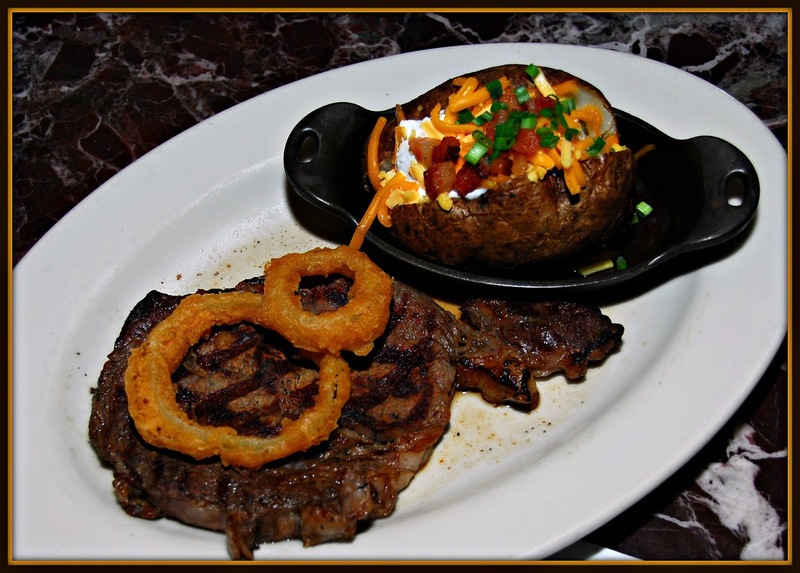 Grand Lux serves only Prime or Certified Angus Beef®. Their beef is corn-fed and aged for up to 4 weeks. Then, it's seasoned and wood-grilled to seal in its juices. The ribeye was cooked perfectly, topped with an onion ring, and served with a tender baked potato with all the trimmings. The beef was juicy and tender, with a slightly smoky taste from the wood grill. 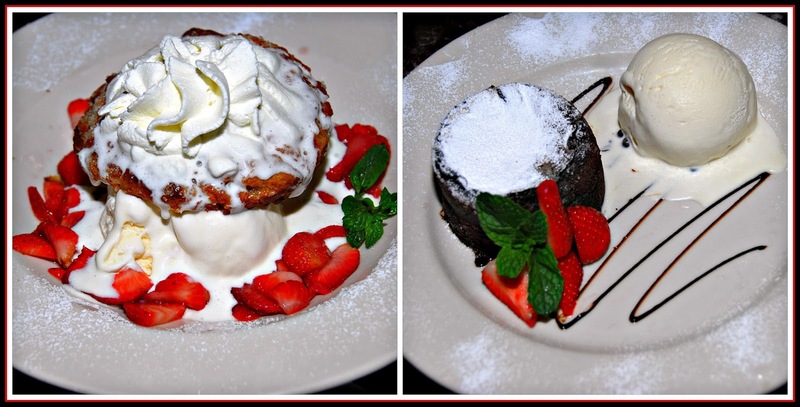 We ended our meal with a duo of shared desserts. We shared Grand Lux's signature Fresh Strawberry Shortcake and a Molten Chocolate Cake. The shortcake featured a warm and slightly sweet sugar-topped shortcake, perfectly ripe fresh strawberries, vanilla ice cream, and whipped cream. The combination of perfectly baked shortcake, tart strawberries, ice cream, and whipped cream was a real winner. The Molten Chocolate Cake is baked to order -- so allow 30 minutes for it to be prepared. Grand Lux recommends ordering this dessert when you order your entree. This decadent chocolate cake is served warm, with a scoop of vanilla ice cream and berries. The cake oozes warm chocolate lava from the center when it's cut. This rich dessert is perfect for sharing! 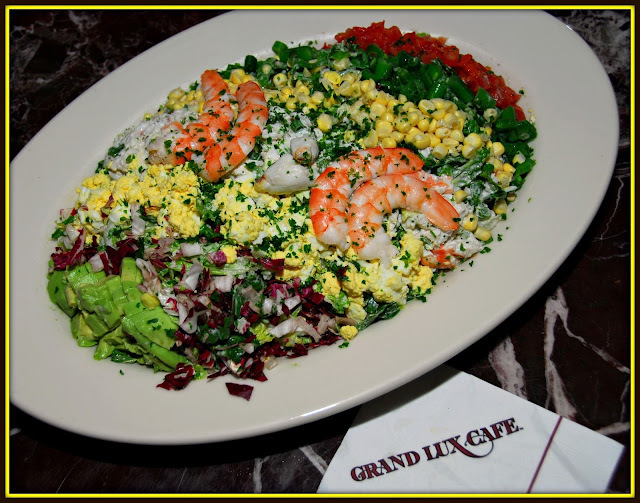 Our dinner at Grand Lux Cafe was absolutely delicious, and the waitstaff was friendly and knowledgeable. Their large menu offers a wide range of options for all tastes, so there's literally something for everybody to enjoy. 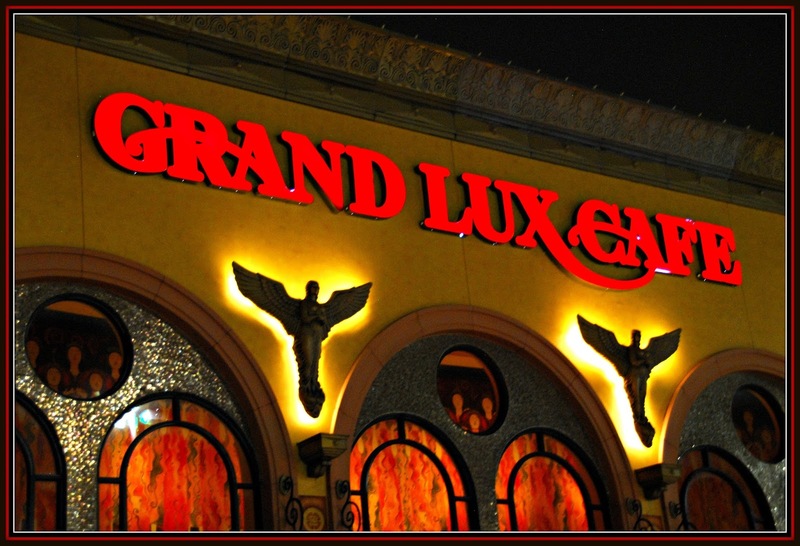 To find a Grand Lux location near you, be sure to visit their convenient online Location Finder. 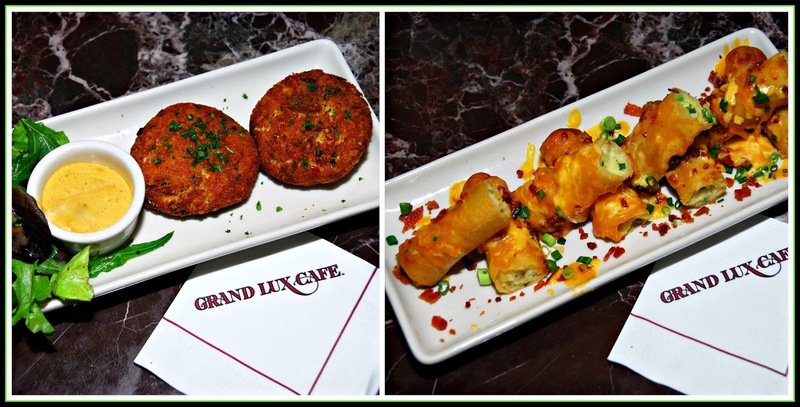 Disclosure: Grand Lux Cafe hosted our group for a dinner tasting at their Houston location to facilitate this article. All opinions are solely mine, and all photographs are copyrighted by Michael K. Garcia. They may not be copied or otherwise used without prior permission.